Designed for a functional purpose, the Jaccard Advanced Ceramic Vegetable and Fruit Peeler is the perfect addition to any kitchen. This efficient peeler is made from ABS, ceramic, and TPR which makes it sturdy and durable. It has a black and white finish. 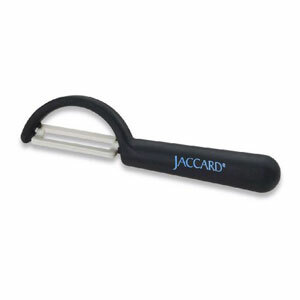 The Advanced Ceramic Vegetable and Fruit Peeler from Jaccard is easy to use and has a manual operation. It has an ergonomic, soft grip handle that ensures a very firm and comfortable grip. This handle is slip resistant too. This peeler is PTFE free and PFOA free, which makes it safe for use. This extremely handy peeler is easy to clean and maintain and is dishwasher safe (top shelf only). Swivel peeler is ideal for peeling fruits and vegetables that have relatively oval surfaces such as apples, potatoes, carrots and more. Jaccard's Advanced Ceramic blade maintains its factory edge up to 15 times longer than stainless steel blades. Ultra pure ceramic composition prevents browning of fruits and vegetables. Eliminates transfer of metal ions that can alter the taste and smell of fresh foods. Non-stick blade surface is easy to clean. Ergonomic, soft grip, slip-resistant handle provides unparalleled balance and comfort. Precision engineered to provide superior strength. Ideal for everyday use - Lightweight, versatile, durable and affordable. Easily convertible for left-handed use.